Among the multitude of books on Buddhism now available to Westerners, Daring Steps Toward Fearlessness is remarkable for its accessibility, inclusiveness, and authenticity. Ringu Tulku renowned for both his insight and his Western-friendly style has produced a breathtaking overview of the Buddhist path that embraces all three traditional Buddhist yanas or spiritual paths. He weaves a dynamic synergy that reveals the vital role of each path in the attainment of genuine realization. Bringing the teachings back repeatedly to the reader's own experience, Ringu Tulku both educates and inspires, connecting the Dharma's profundity with the spirit of the Buddha's awakening. 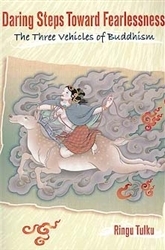 Daring Steps Toward Fearlessness draws on several venerable sources, ranging from the Buddha's earliest teachings to a Vajrayana text by the yogi known as Crazy Khyentse. Ringu Tulku brilliantly takes us from the most basic meditation practice to the rarefied realm of Mahamudra, touching on a dazzling range of teachings and techniques along the way. As much practice manual as scholastic accomplishment, this articulate, lively presentation will be eagerly sought after as both a trustworthy introduction for the beginning student and an indispensable reference for practitioners at every stage of the path. Teachings of the Earth by John Daido Loori Indestructible Truth by Reginald A. Ray A Heart Full of Peace by Joseph Goldstein Buddha's Brain by Rick Hanson, Ph.D.